It finally happened! Taj and Willie are playing together after weeks of uncertainty. I believe that Willie was fearful of hurting the little guy when he first came home. But now Taj is over 20 pounds and it’s all paws on deck. They romp and mouth each other constantly, sometimes worrying me that they play too rough. Actually the two have become inseparable. They chase, play tug of war, and roll across the floor. Taj’s little body can fit perfectly under Willie’s so that he has the advantage of grabbing the ball from underneath. Willie is clueless in protecting his toy from the “Taj-omatic” attack from below! Last week, Willie decided to show Taj how to run at full speed. They were outside playing just after a big downpour. Willie sped across the lawn at full force while unfortunately crossing a thin patch of grass. He entered into a long skid landing flat on his belly. Now the middle of the lawn had become a muddy “Slip and Slide.” Of course little brother wanted a piece of that action and followed suit. He too went sliding through the mud, including a little nose digging along the way to be sure every inch of his body and face displayed enough brown goop and wet grass to impress his big brother. Their fun continued until I put the kibosh on their muddy speedway competition by requiring baths and a little “chill” time. 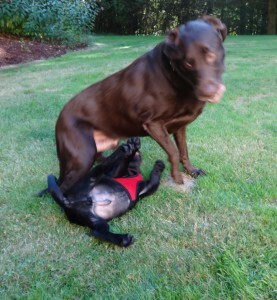 What fun our puppies can have in the great Northwest. “Slidin’ in the Rain” doesn’t get any better than that! Moved to Clark County in 1981. Spent our first year of marriage in Alaska and childhood and college years in Ohio. Happily married for over thirty years raised four dogs, two cats, and one son...life is good!